Here is Obama's draft of the Authorization for Use of Military Force against ISIS. Here is the statement he released about it. 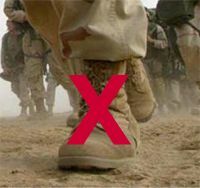 [c] LIMITATIONS.— The authority granted in subsection (a) does not authorize the use of the United States Armed Forces in enduring offensive ground combat operations.